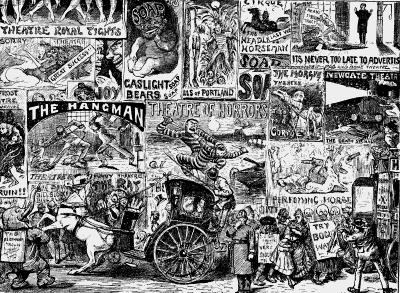 From Punch: Sky signs of London, 1890s. It would take an intrepid novelist to invent the life of Behramji Malabari, whose 160th birth anniversary falls in 2013. My own imagination quails at the thought of creating a formidable Hindu reformer who was born a Parsi in Baroda, and educated at an Irish mission school in Surat after the death of his father, where he was adopted by a childless Gujarati spice-trader. Behramji took his name, Malabari, from the Malabar spices in his adopted father’s shop, though his love for writing and for reform was entirely his own. He began his career as a Gujarati poet; when he switched to English, the results were dismaying. “See! how lordly Nizam glares! He did not merely “write better” in Gujarati–the Behramji Malabari who wrote and compiled his poens and thoughts in Niti Vinod was a different person. That early collection foreshadowed his interests far better than his English verses, as though his political self could only emerge in Gujarati and was stifled by English. Niti Vinod includes odes bewailing the curse of infant marriage, the “prayer of a Hindu widow”, an appeal to a religious Mahajan: all the areas where he would argue for reform in subsequent decades, all of his passions, are set down here. Malabari sent his English poems to Max Mueller, who wrote him a gentle letter of cautious warning: “Whether we write English verse or English prose, let us never forget that the best service we can render is to express our truest Indian or German thoughts in English…” Their role, Mueller said, was to be interpreters between two cultures; he did not want Malabari to forget his own history, his own language. In subsequent decades, Malabari would translate Mueller’s lectures on Hinduism, attempting to justify his own argument that some of the Indian guardians of religion had misinterpreted the Vedas and the Puranas. 160 years after Malabari’s birth, it is not his poems that should be exhumed from their well-earned grave, but his prose. When Malabari wrote Gujarat and the Gujaratis, some seven years after he published his volumes of verse, he became part of a generation of Indians who were reversing the gaze of the traveller to the Orient. He had trained as a journalist at the Times of India and by the time he took over as editor of The Spectator, Behramji Malabari’s paper was part of the new, thriving, often robustly combative school of Indian journalism—from the Hindoo Patriot and The Pioneer to the Indian Statesman and the Indian Mirror, “native” Indian journalists had begun to report on their own country. Often, they addressed the gaps in the British newspapers, as Mookerjee’s Magazine did by carrying a running series of reports on the Bengal Famine. Gujarat and the Gujaratis reminds me of the very contemporary explorations of their own cities, and of the “other” India, undertaken by writers such as Aman Sethi, Sonia Faleiro and Amitava Kumar. The gap of a century shows not so much in perspective, but in craft: Behramji left out the fact that he had walked across large stretches of Gujarat, for instance, bowing to the prevalent belief that a traveller must editorialize more than report. A few years later, he published a remarkable book, The Indian Eye on English Life. Malabari, who began by trying to imitate the English, and then by reporting like a tourist on his own country, would close his literary career with this absolutely confident, voluble, lengthy travelogue. He turned as close and as carefully scrutinizing an eye on Britian as any traveller from the West had done on India: this was the Exotic Occident. England’s cities were crowded, he reported, their food barbaric, and the sexual freedoms he observed challenged many of his own set views. Everybody ate too much, talked too much, walked too fast, and yet, he admired their energy and their political engagement. After his return, Malabari was interviewed by a Bombay newspaper. “How much I wish my countrymen travelled more freely, and that they studied history, modern and ancient, with a tithe of the zeal they devote to barren rhetoric or still more barren speculation.” Over a century later, much has changed in India, but versions of Malabari’s complaints—and his optimistic belief in change—survive, side by side.